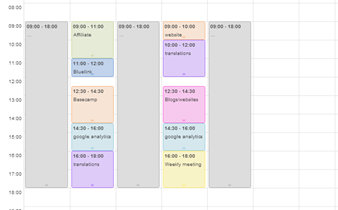 Hours in a work day: 8; Number of Meetings on average per Week: 15. 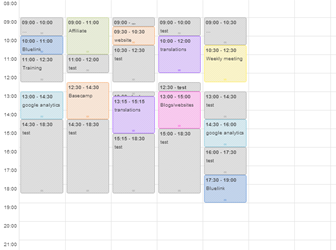 How can I manage my time in the best way possible? It‘s Monday and you take one look at your calendar: of course it‘s already full and everything is exploding all over the office. You just came from the first meeting of the day and trying to prepare yourself for the next one but due to the chaos, it’s not working and you’re basically wasting the little time you had. At the end of the day, you find yourself exhausted and even worse, with the feeling that you haven´t completed anything. And that was just on Monday. How are you supposed to manage the rest of the week like this? What if i told you, there is a way that can help you and the others be more effective? As I’m sure you know the feeling, you sit in a meeting, which is planned for one hour and then after two hours, you realize that you are supposed to be in a different meeting in 15 minutes and you still haven’t come to a solution in this meeting. Everyone is talking and very often the topic changes to nothing important. And this lasts like this for most of the week. I started realizing that most of my days are spent in meetings, meetings which take too long as we were not being effective. I wanted to find out how much time I’m actually spending in meetings, how much time I’m planning to be in meetings and what we are actually getting done, so I decided to track it for one week. For one week, I just started adding the meetings to the calendar and took a note of if we completed everything and how long the meetings took. After the one week, I noticed that 3-4 meetings had to be cancelled or postponed because we didn’t manage to sort everything out in time although I spent most of my days in meetings. I ended up having to finish some things at home because I couldn’t manage to do it after/in between meetings. This caused me to also miss out on the activities I like to do outside of work, like going to the gym, meeting friends and just relaxing. For the following week, I decided to plan the meetings one after another in 2 days and putting the time for the meeting in a realistic way. Although I knew that these 2 days would be hectic, I was hoping that at least the other 3 days I could get done what I wanted to get done and not have to worry about it at home.